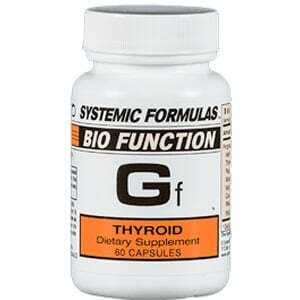 Gf – Thyroid by Systemic Formulas is the top thyroid supplements in my clinic. It builds and balances the thyroid gland without stimulating it, supporting its abilities as a master control gland for healthy metabolism. Helpful in assisting with weight loss, combating jet lag, and normalizing bowel and circadian rhythms. 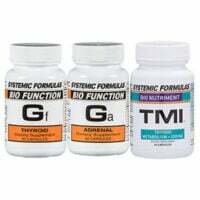 This formula is NOT suitable for those taking thyroid hormone. The thyroid plays a key role in communication between the Adrenals, Pituitary, Hypothalamus, Ovaries, Testes and Parathyroid glands. It helps metabolism, weight, the bowels, hair and more. The Thyroid is often affected by the Adrenals, especially in our super-fast lifestyle which tends to exhaust the adrenals before the thyroid. 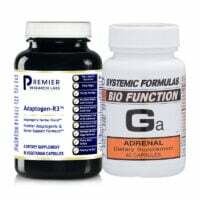 I highly recommend taking Ga-Adrenal in the afternoons and Gf – Thyroid in the morning (as long as you are not on prescription Thyroid hormone). 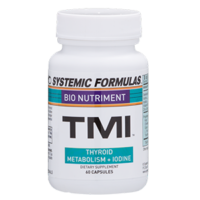 The formula known as TMI (for thyroid metabolism plus Iodine) works well with Gf. You can buy all three at this link. Consider taking the mineral Selenium a few days every week long-term if you have had amalgam fillings in your mouth or have eaten a lot of Tuna. Amalgam fillings and Tuna contain Mercury, a toxic element which interferes with the conversion of T4 thyroid hormone to the active T3 hormone. Gf – Thyroid may be helpful during menopause to nourish the Ovaries and Adrenals and bone metabolism. It is useful when crossing multiple time zones to help reset circadian rhythms. Take it in the morning in your new location. 1-2 capsules up to twice a day for 3 months. Then as needed for maintenance. Best taken in the morning and/or early afternoon. This is the top thyroid supplement in my clinic since 1985. Irish Moss; Pata de Vaca; Abutua; Kelp; Cucurbita Pepo; RNA/DNA Lung Tissue Factors; RNA/DNA Thymus Tissue Factors; RNA/DNA Thyroid Tissue. Jack Tips from Systemic Formulas explains the value and use of this 40 year old formula in this short video.